...Looking for ways to boost your children's confidence and self esteem? ...Feeling you’re juggling multiple roles, and worrying you’re not doing parenting right? ...Looking for easy ways to help your children manage their emotions? ...Finding yourself repeatedly asking your children to do things before they finally do what you ask? ...Wanting practical parenting tips, which actually work! ...Finding bedtimes, homework, mealtimes a constant battle? I hear YOU and you’re not alone. I am a psychologist and Mum of two. You might think my role involves a lot of telling people what to do, that I have a magic route map for success and happiness but what I have become surer of over the years is that the right route map differs wildly from one family to another. My job is therefore about supporting and allowing parents to bravely find their own unique way to empower their children to become their best selves. Once you allow your authentic voice to speak those day to day parenting challenges become easier to navigate. The route map becomes easier to read and parenting becomes a whole lot more enjoyable. My holistic approach integrates behavioral strategies, mindfulness, goal setting, and mindset shifting techniques. They have proved to be highly effective throughout my years as a one to one practitioner. I now want to reach out and share these resources with you. Percentage of final exams I failed at 18 years. Number of times I’ve lost my patience with my own children. Number of years I’ve been a psychologist. Number of nannies, teachers and carers I’ve trained in mental health. 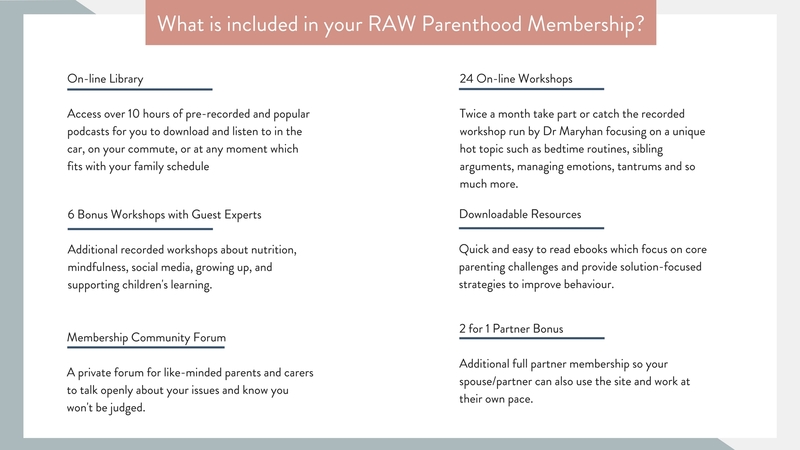 What is included in your Raw Parenthood Membership? Downloadable Resources Quick and easy to read ebooks which focus on core parenting challenges and provide solution-focused strategies to improve behaviour. 24 On-line Workshops Twice a month take part or catch the recorded workshop run by Dr Maryhan focusing on a unique hot topic such as bedtime routines, sibling arguments, managing emotions, tantrums and so much more. 6 Bonus Workshops with Guest Experts Additional recorded workshops about nutrition, mindfulness, social media, growing up, and supporting children’s learning. Why You Need The Raw Parenthood Community Today? Parenting is very different now than it was fifty, twenty or even ten years ago. We live in a demanding modern world and we are facing new challenges as parents. We live further apart. Parents and children are busier and there is greater pressure on getting parenting ‘perfect’. This membership site has been built by me to help you navigate parenting in the modern era. I want you to have resources at your fingertips so that you can build healthy roadmaps that are appropriate for all your family’s needs. Are you ready to be a part of a supportive Parenting Community? Founding members also get a free 45 min. 1-1 video conference call with Dr. Maryhan. Exclusive parent workshop on How to get children to listen, and do what we ask first time! “Maryhan has been involved in all 3 of my children’s lives for one reason or another over the past 9 years. 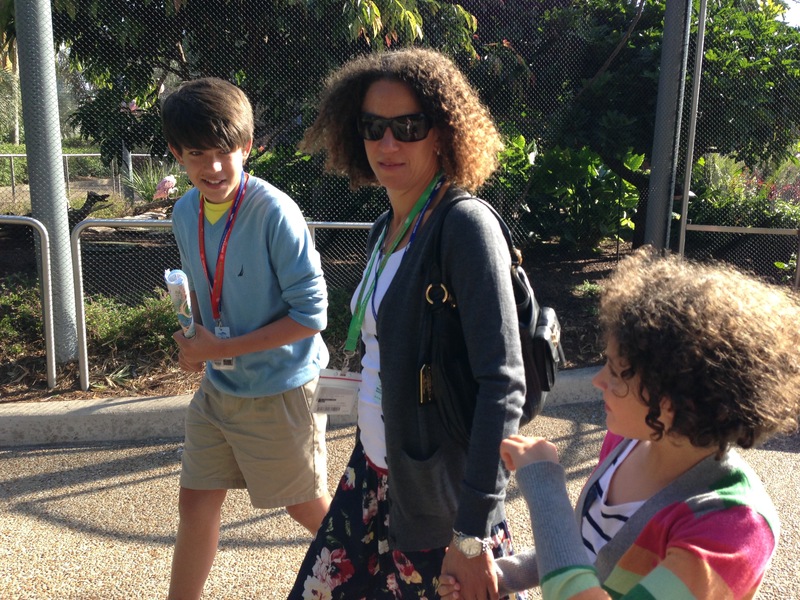 She has helped to develop social, emotional and educational skills tailored to each child. Her approach is so laid back and fun that the children didn’t even realize they were learning. I am so grateful to her for her support! Is membership to Raw Parenthood really as good as it sounds? YES! And if you want to know more and understand why review the questions and answers below! Can I stop this membership at any time? Yes! Raw Parenthood is a monthly subscription and if you ever feel it’s not suiting your needs you can always cancel and you are welcome back anytime. Two live and interactive Q&A talks with Dr Maryhan. One Q&A session ‘Ask The Expert’, on a new topic each month. Monthly focus topics with actionable home-based How-Tos. A community of like-minded parents. Can I do this even if I'm super busy? YES! That is why Raw Parenthood exists. It’s here for you to dip in and out of. All of our webinars are live but they are recorded and available to watch at a time convenient to you. The library of resources is always available online for your to get practical tips and strategies to deal with your current parenting challenge. Mothers, father, aunts, uncles, grandparents, caregivers, childminders, teachers, nannys, godparents…. This membership is for anyone who is interested in raising healthy and confident children. I don’t think we were born to raise children in isolation, we are born to share ideas, stories, and hope. If you’re ready, let’s start the journey together….